"This is really bizarre," said co-author Roberto Abraham, an astronomer at the University of Toronto. "For a galaxy this size, it should have 30 times as much dark matter as regular matter," he told AFP by phone. "What we found is that there is no dark matter at all." "That shouldn't be possible," he added. There are 200 billion observable galaxies, perhaps more, astronomers estimate. Some 65 million light-years from Earth, NGC1052-DF2 -- "DF2" for short -- is about the same size as our Milky Way, but has 100 to 1,000 times fewer stars. Dark matter's existence is inferred from the motion of objects affected by its gravitational pull. "It is conventionally believed to be an integral part of all galaxies, the glue that holds them together and the underlying scaffolding on which they are built," said co-author Allison Merritt from the Max Planck Institute for Astronomy, in Germany. So-called ordinary matter -- including stars, gases, dust, planets and everything on them -- accounts for only five percent of all content in the Universe. Dark matter and dark energy comprise the rest, and scientists have yet to directly observe either. The discovery was made with a new kind of telescope developed by Abraham and lead author Pieter van Dokkum of Yale University. Unlike mirror-based devices, the mobile Dragonfly Telescope Array is composed entirely of nano-coated lenses, 48 in all. "Conventional telescopes are good at finding small, faint objects. Ours is really good at finding large ones," said Abraham. Indeed, over the last few years Dokkum and Abraham have used it to uncover a whole new category of sparsely populated "ultra diffuse galaxies" -- and sparked a cottage industry as astronomers struggle to explain their strange properties. "Everything about them is a surprise, starting with the very fact they exist," Abraham said. Up to now, the analysis of galaxies has shown a fairly tight ratio of dark to ordinary matter. But this new class "is breaking all the rules," he said. The first anomalies discovered were galaxies almost entirely composed of dark matter. That was odd enough. But the real shocker was DF2, which has virtually none at all. 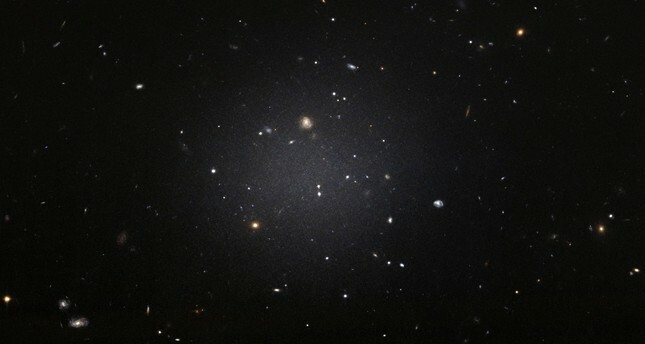 DF2 was first identified by Russian astronomers conducting a photographic survey, but it's uniqueness didn't come to light until later. Dokkum's team used the Keck telescopes in Hawaii to track the motion of several star clusters -- each with about 100,000 stars -- within the galaxy. The clusters, they found, travelled at the same speed as the galaxy, itself moving through the Universe. Had there been dark matter, the clusters would be moving slower or faster. Abrahams recalls seeing the graphic plot showing the motion of DF2's constellations for the first time, and wondering if something was amiss. "We asked ourselves where we had screwed up, if the measurements were wrong," he said. "Then I suddenly realized the implications. That's as close to an 'Oh My God' moment as I got." A galaxy entirely bereft of dark matter raises vexing questions that, so far, have stumped astronomers. "It challenges the standard ideas of how we think galaxies work," said Dokkum. Figuring out how something as big as a galaxy is held together without dark matter will be difficult, but understanding how it formed in the first place will be even harder, he said. Whatever the explanation, a galaxy with no dark matter poses an ironic challenge to astronomers who question the very existence of the substances, according to the study.